Just like a love journey, the energy industry is full of exciting challenges. My journey began studying energy engineering. I saw many problems in the energy industry: climate change, underserved communities, and wasted resources. Over time I began to question how I would make this business more sustainable and pursued an MBA degree at Brandeis University. I then met BlocPower and settled down as an Investment Associate, where I help solve access to capital issues within the energy industry. At BlocPower, we have worked hard to establish an innovative business model that will bring clean energy to underserved communities in a fast and affordable manner. BlocPower is applying IoT and machine learning technology to lower the cost of marketing, engineering design, and financing. My daily work includes portfolio financing, financial modeling, and creating software that automates the calculations for energy-financial analysis. I love working with mechanical engineers and technology developers because I get to interact with people from a diverse set of disciplines and backgrounds. I believe our model with help bring the energy industry get to the next level by providing an integrated solution that actualizes the 3 pillars of sustainability (environmental conservation, social impact, and financial return). 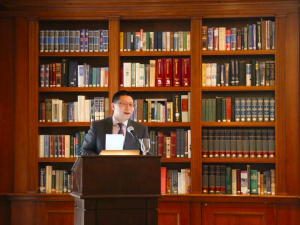 Recently, I was lucky to be invited to give a speech at the 16th annual Wall Street Green Trading Summit, hosted by the Princeton Club. I shared BlocPower’s work and our experience doing community outreach through machine learning. People didn’t believe community outreach planning could be profitable until they heard about what BlocPower does. At the summit, I met brilliant people working on all kinds of green energy and we all agreed, this industry has a bright future. I am proud that our team is making a profound impact. The summit speech was a shining memory on my journey and I am excited for many shining moments to come at BlocPower.